Click here to download the whole guide as a PDF. Click here to order copies! Why do any of us pay union dues? It’s because we feel our union fights for us, and we consider it important to our lives. So one key to surviving an open shop is to do the essentials that unionists should be doing anyway: Win grievances. Fight for a good contract. Report your victories and struggles. Consider the Jeffboat shipyard. In the years after Indiana went right-to-work, only one person dropped out of the union—in a workforce of 700. Teamsters Local 89 held onto members’ loyalty because it had a deep bench of stewards who actively sought out workplace problems to fix. On a dangerous job where fatal accidents were on everyone’s mind, they made safety a top union issue. Because the local went on strike when necessary, members had good wages and health insurance—the value of the union contract was self-evident. And stewards were systematic about always asking new hires to join. Grievances are one common way that members see the union fighting—or don’t. So when a worker brings up a problem, it’s a mistake to say, “Now leave it to me.” Instead, the steward should work through every grievance with the affected worker as a teammate. 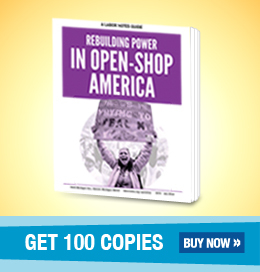 Postal unions across the country are open-shop. Yet the Boston Postal Workers (APWU) local hovers around 94 percent membership. President Scott Hoffman said this high rate has a lot to do with involving members in every union activity, including grievances. With every grievance, ask, “Who else is affected?” Look for opportunities to make it a group grievance and have members submit their own statements. Much more effective than a grievance, though, is shop floor action. People who would never act alone will find courage to act together with others. The more people participate in solving a problem, the more they will develop the skills and confidence to take on other problems, and the union’s power will grow. When three West Virginia grocery workers got unfair write-ups from the same manager, they asked shop steward Auriana Fabricatore what she could do. She turned the tables back on them. Together they marched into the office and gave the wide-eyed boss a piece of their minds. He tore up their write-ups on the spot. “A subtle change, but huge,” Fabricatore said. Your goal is to develop a union culture in the workplace—not just at the union hall—where people expect to participate in defending the contract and defending each other. WHAT EXACTLY DO YOU WANT? Identify the solution you're after, and make sure it's one that's winnable. WHO HAS THE POWER TO FIX THE PROBLEM? It’s not enough to say “management.” Figure out which person in management could say yes to your solution. WHICH TACTICS CAN WORK? Aim your actions to build the pressure on the decision-maker you’ve identified. Consider how much pressure it will take to win, and where your leverage is. That’s how his union maintains 90 percent membership in California oil refineries, where workers get a window of opportunity to drop their membership every time the contract expires. Members have developed the habit of acting for themselves as a union. Leaders encourage them to bolster a grievance with workplace action. For instance, a supervisor had forbidden people to wear baseball caps, sunglasses, or Hawaiian shirts in the control room. Workers collected signatures on a petition and presented it to the other supervisor, who crumpled it up and threw it away. Does the action relate to your issue? Will it increase the pressure on the decision-maker? Is it timed for effect? Is it new and different—or tried and true? Are enough people ready to do it? How will others react? Will it unify people? How will management react? Could it backfire? Does it violate the law or the contract? If so, are you prepared for the consequences? Here's one more story from letter carriers in Portland, Oregon, who manage to keep their membership numbers well above 90 percent. One time last year, carriers were told they must deliver three “full coverages” in a single day. A full coverage is an advertisement that goes to every household, along with the mail. Two of the three were magazine-thick. That’s a lot of weight to carry around all day. There was general “panic and angst,” said Organizing Chair Willie Groshell. So he encouraged everyone to fill out a safety concern form. Some were nervous, but one by one, people filed up to drop their forms on the manager’s desk. About half the carriers on shift that day participated. And that was all it took. Within minutes the manager agreed to postpone the heaviest item till the next day. Palpable relief and power zipped around the work floor. Is it widely felt? Many people must feel that this is a real problem and agree with the solution you’re pursuing. The heavy mail assignment is a good example—every letter carrier was affected. Is it deeply felt? It’s not enough that many people agree if none feels strongly enough to do anything about it. The grocery workers were so furious over the unfair write-ups that they found the courage to do something they’d never done before—march into the manager’s office. Is it winnable? It’s hard to know for sure whether you will win, but it’s possible to get a good idea of whether you can. Identify the decision-maker who can give you what you want. How hard do you expect this person to resist, and how much pressure can your group muster? Does it build the union and build leaders? You get the most bang for your buck when you choose an issue that will draw in people who’ve never been involved before, unite groups that don’t usually see eye to eye, or inspire your co-workers to go one step further than they’ve gone in the past. That way your union gets stronger with every fight. A version of this article appeared in Labor Notes #472. Don't miss an issue, subscribe today.